Is called "Tjerna". A veteran midfielder with a great amount of experience. Has through the years been more and more defensive. Not the fastest player on the pitch but he compensates that with a great understanding of the game. Makes very seldom a bad game. 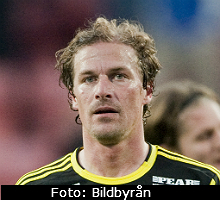 When AIK won the swedish championship 2009, "Tjerna" made the winning goal against IFK Göteborg.